Inspiration boards are always a perfect place to start when planning your wedding for your special day. Pop by and see our latest editions to our inspiration boards, including Pantone's two colour of the year: Serenity and Rose Quartz. Two colours introduced by Pantone, as a joint colour of the year. 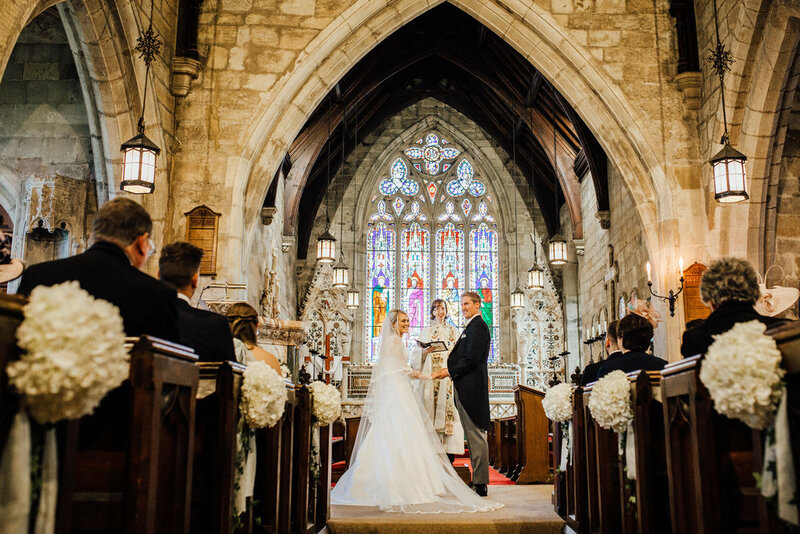 Bringing a perfect balance between calmness and romance, the ideal atmosphere for any wedding? 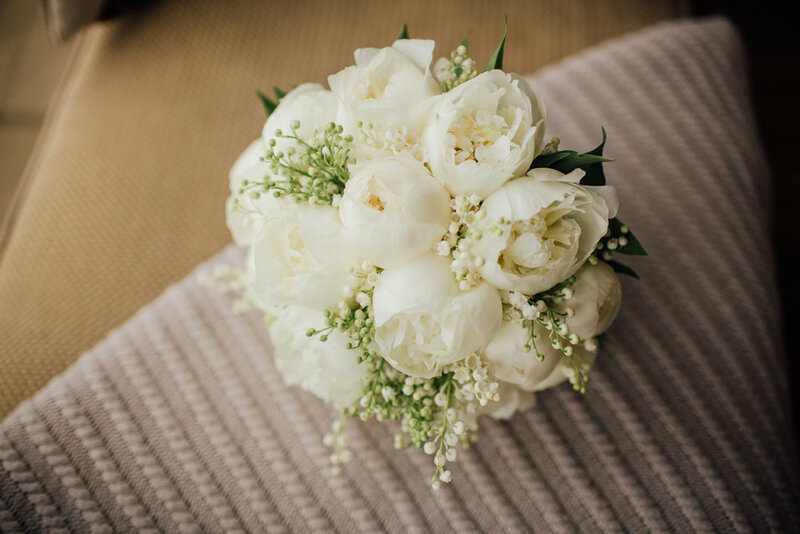 We frequently update our inspiration boards, bringing brides up to date trends and inspiration for their special day. Don't forget pop by, to keep an eye on our latest predictions and ideas. 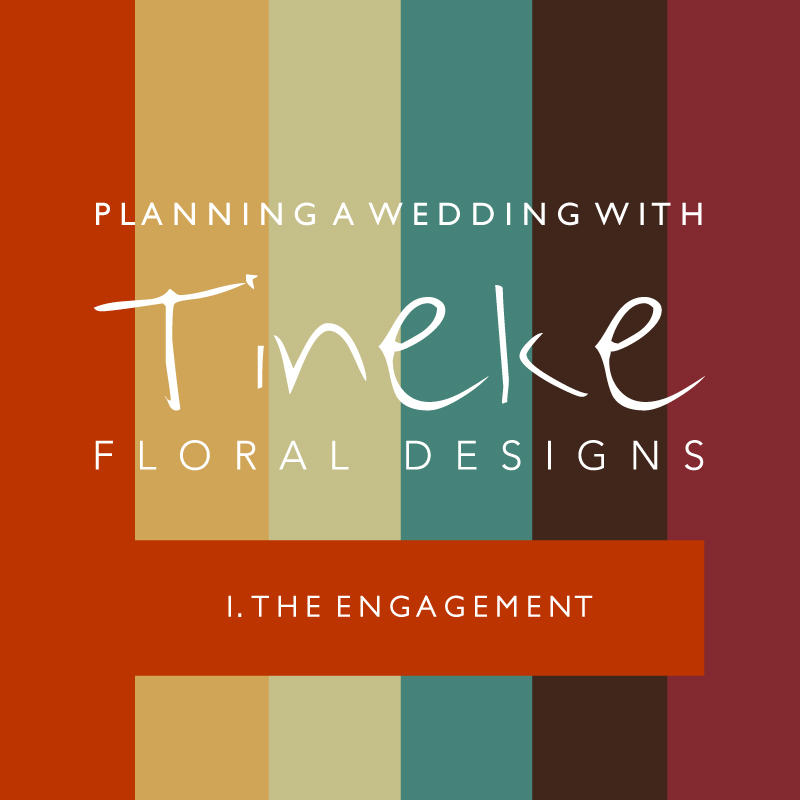 Simply use to take inspiration from, or why not use to bring along to your Tineke wedding flower consultation? Making sure Kerry knows what vision you have for your big day. For more inspiration or trends, follow us on Pinterest. 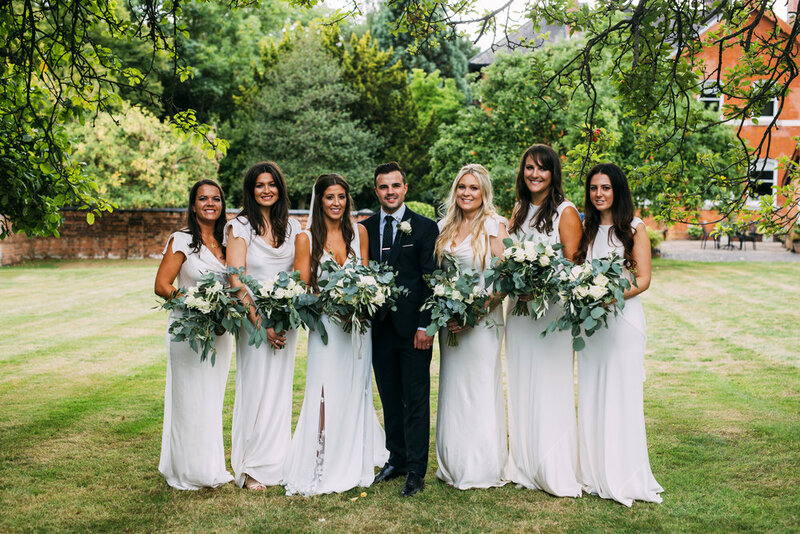 We were delighted to provide the wedding flowers at Langley Priory, Derby for the summer wedding of Meghan and Paul. When we first met with Meghan, who is from the States, and Paul, we clicked straight away and you could see how very much in love they were with each other. 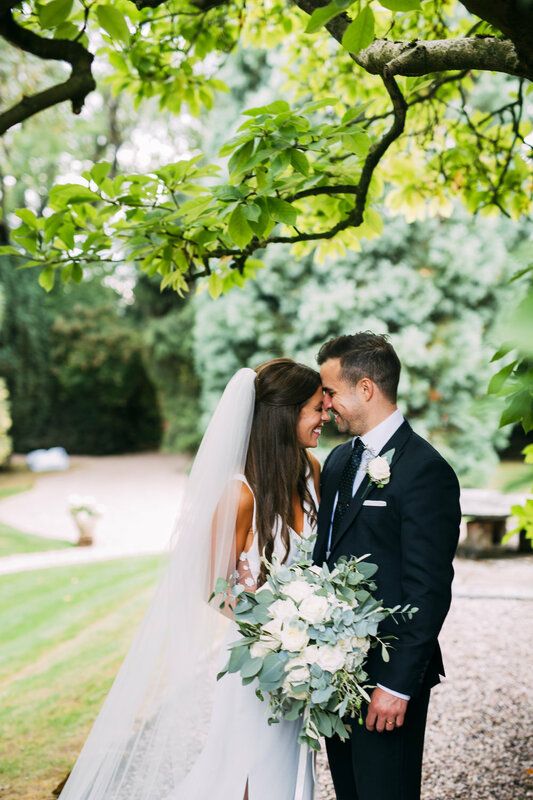 Meghan had fabulous ideas, incorporating bark and gorgeous flowers, for their wedding flowers at Langley Priory, we knew it was going to be a very beautiful wedding. 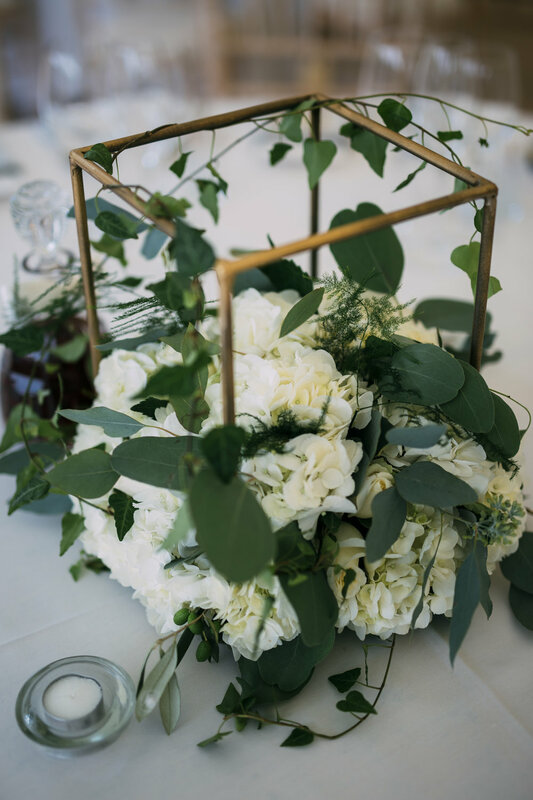 We discussed the use of large blousy flowers for the romantic but rustic feel that Meghan and Paul wanted to achieve with their wedding flowers. This included our all time favourite cream Hydrangeas, soft pink Peonys, Astilbe, cream Peonys, green Amaranthus, Lisianthus, fragrant Stocks and Bouvardia. 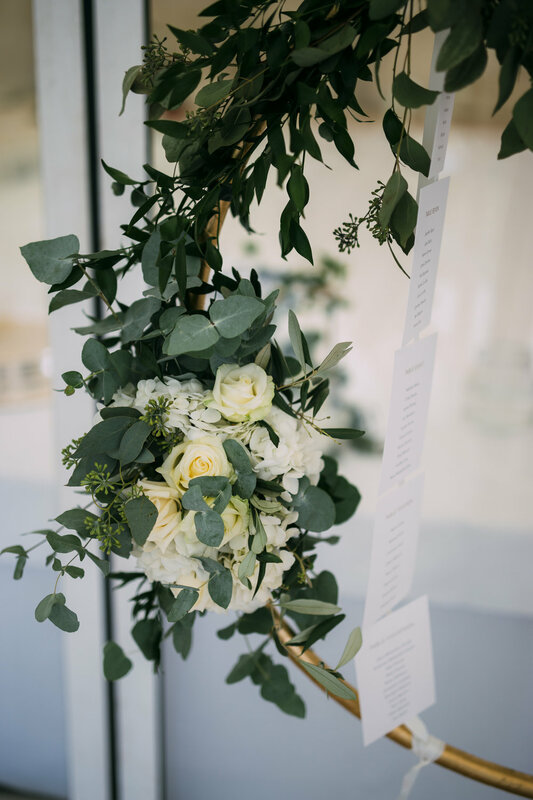 The bark vases were a huge hit with everyone that saw them in the marquee and they looked wonderful alongside the cork detailing that was used for the seating plan. It was great to see Alison Jenner creating the wedding hair and Cristina Lazzarotto doing her thing with the make up, Meghan is a stunning lady and looked amazing on her wedding day. The cake was also stunning by Jess at Green and Stock, Nottinghamshire. 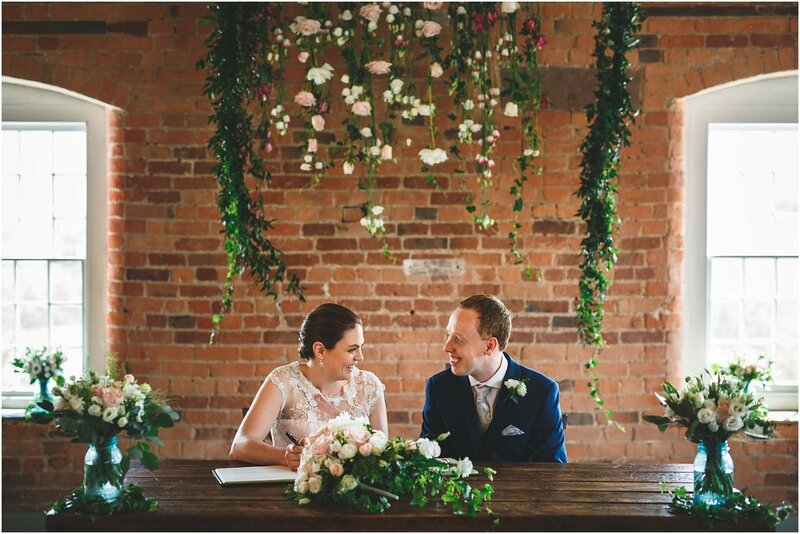 Tim and Teri-Lee at Langley Priory are so warm and welcoming and made space for us at their home to create the table flowers on site the day before, we were worried about the Download festival traffic affecting us, luckily it didn't! And we were back on the wedding day with the bridal bouquet, bridesmaid flowers, buttonholes and corsages. 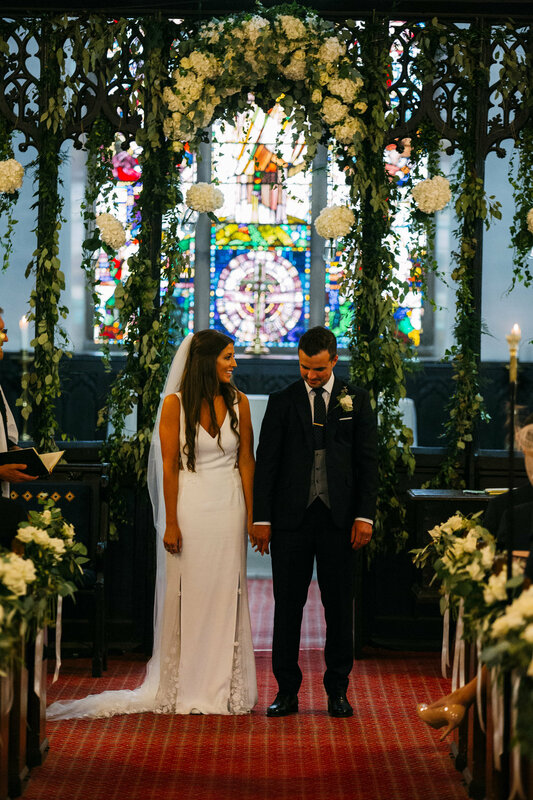 The ceremony was held at the Breedon on the Hill Church, which we decorated with hurricane vases, petals and bay trees. 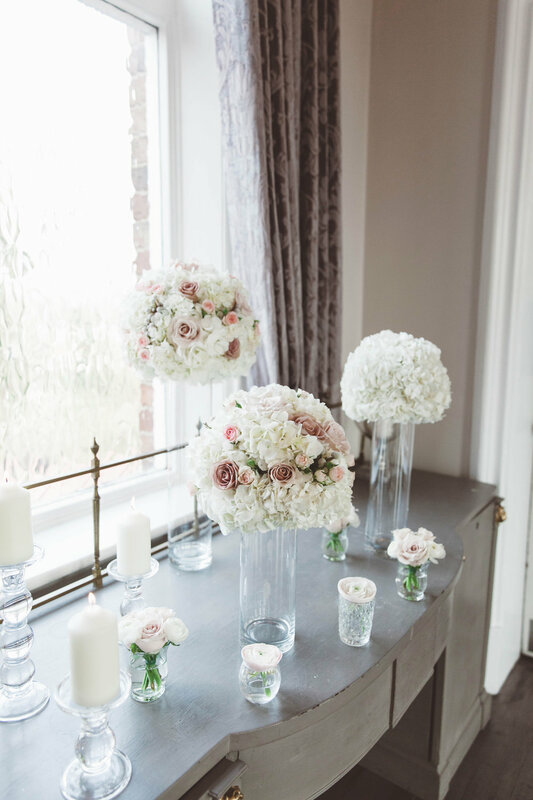 The bay trees and hurricane vases were then re-used at the marquee reception. We hope you enjoy the images by Darren Cresswell. We were delighted to provide the wedding flowers in Winster Derbyshire for the summer wedding of Henry and Carina. 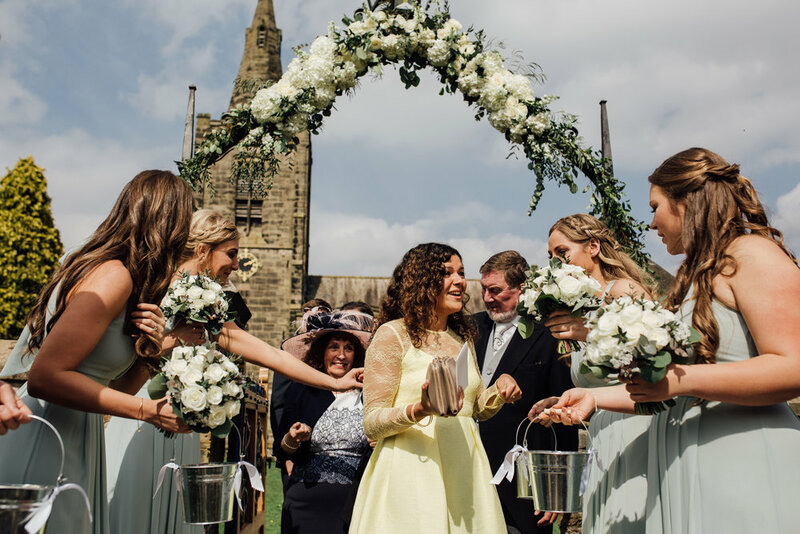 We first met with Carina, Henry and Henry's Mum last Christmas time in Matlock Derbyshire to discuss their initial ideas for their wedding flowers. 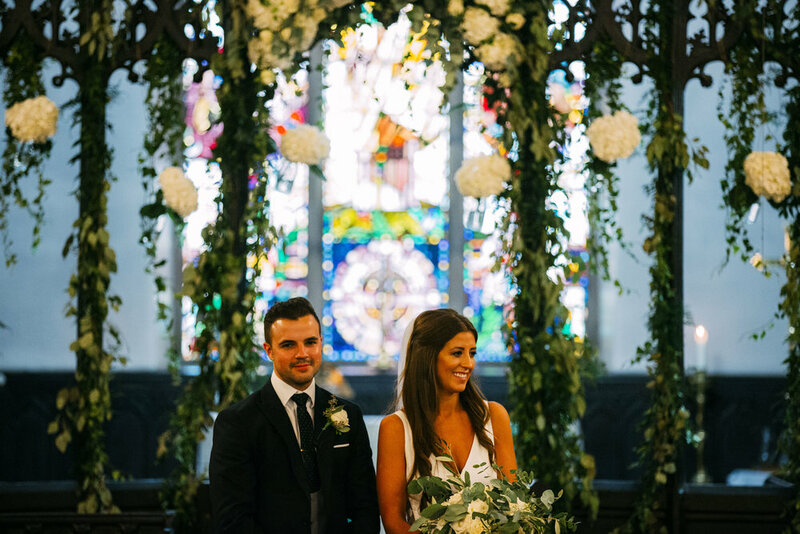 From this first meeting, we knew this was going to be a beautiful wedding based on the bride's flower choices and colour schemes. Carina lives in the States, and was visiting as many wedding suppliers as possible before flying back home. 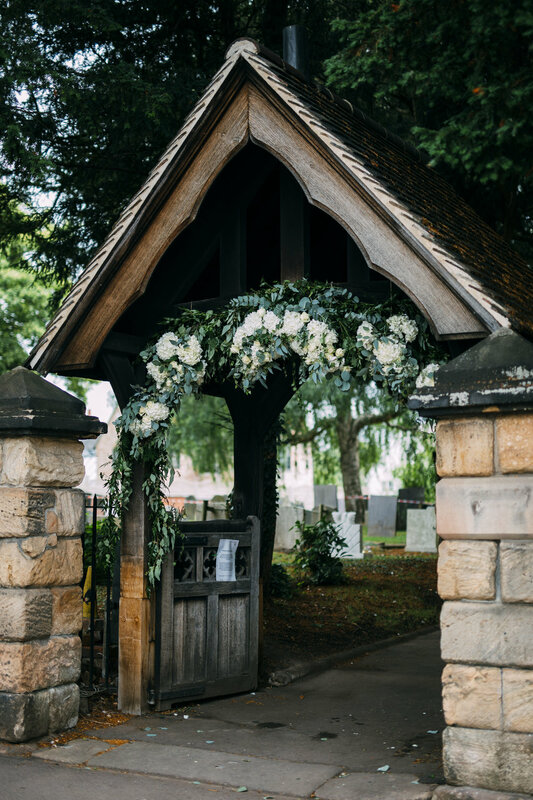 We were very excited to learn that the wedding reception would be held at Henry's family home in Winster, Derbyshire the following summer in August. 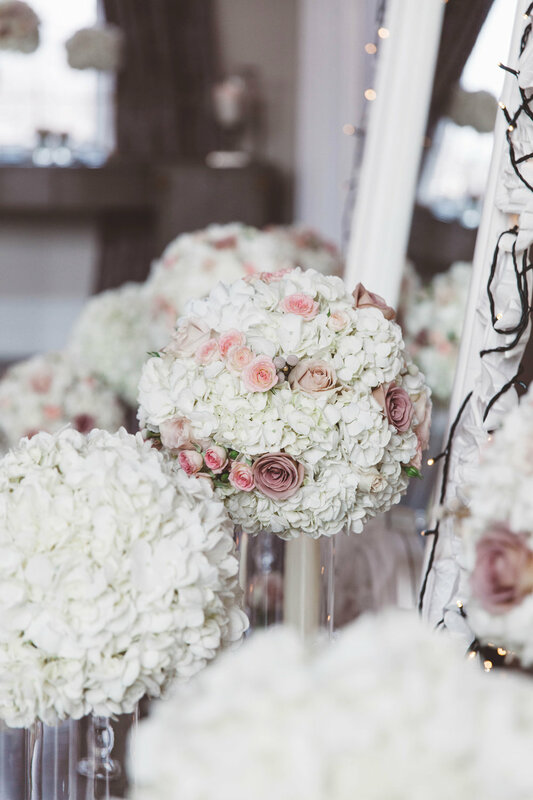 We discussed the use of large blousy flowers for the romantic feel that Henry and Carina wanted to achieve with their wedding flowers. 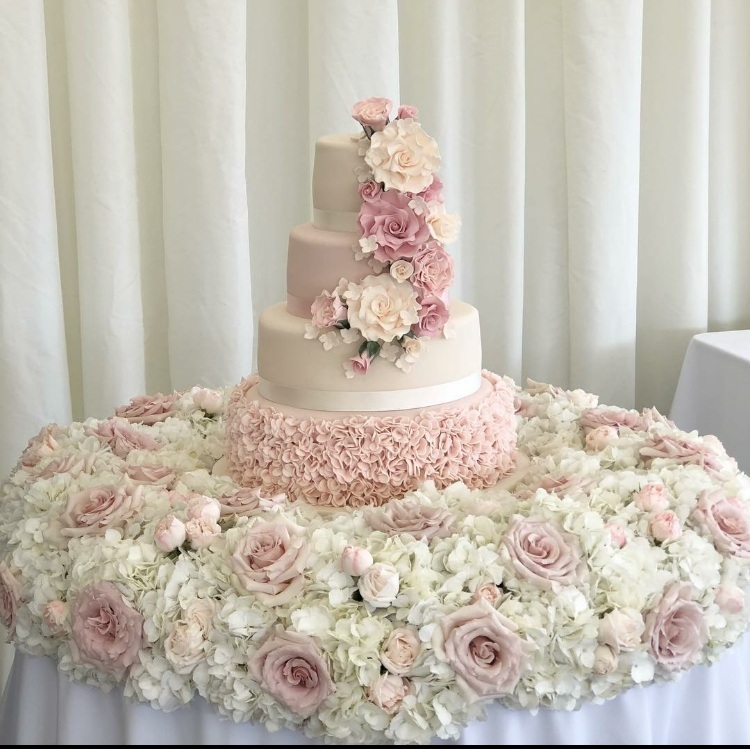 This included our all time favourite cream Hydrangeas, soft pink, peach and blush Roses, feathery Astilbe and Bombastic spray roses. The attention to detail from the marquee company run by Jacquie Andrassy was out of this world, everything was meticulously planned from the colour of the silks on the bar to the colour of carpet, with candles and ghds in the powder room. Working with Carina over email and visits to Henry's mother, we managed to pull everything together and confirm everything as the bride arrived a week or so before the wedding. It was such a joy working on site and creating the floral designs in the family home and to see it all come together. 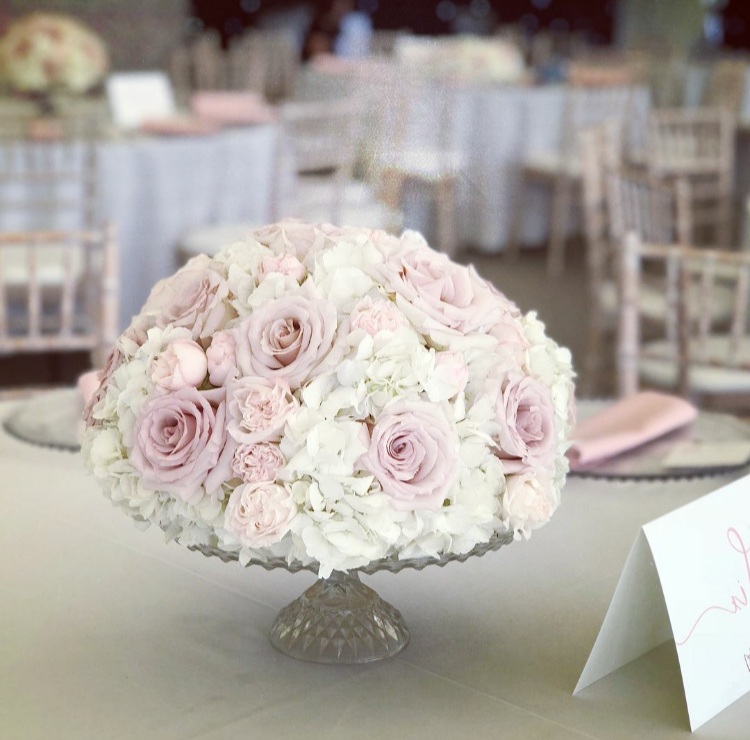 We sourced some gorgeous silver bowls especially for the wedding, and they looked stunning overflowing with Hydrangeas, Roses and Astilbe. Lavender sprigs were used on each napkin tied with delicate silver string supplied by the bride. We hope you enjoy the images by Rik Pennington. 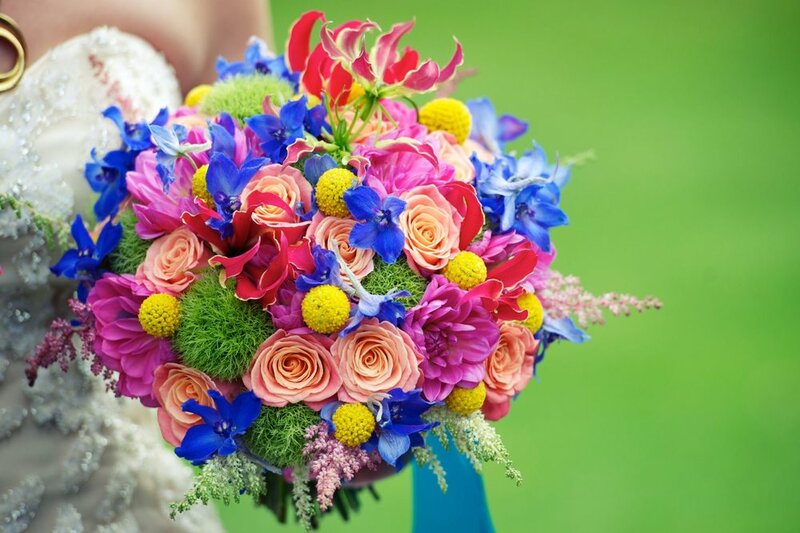 If you’re planning your wedding day and searching for the perfect wedding bouquet then contact The Tineke Team.